DoD IA Training Headquarters (DoDIATHQ), your source for information on DoD Information Assurance and Cyber Security Training. We have everything you need to make your life easier as you begin your career as an information security professional, or as you pursue higher career goals. We will tell you the best training to take, the best resources to make sure you pass those exams, and potential employers! Need something else, just ask! Congratulations for finding this great resource on DoD IA Training and Jobs! This site is great for beginners in the field of information security and information assurance, and also a great place for those who are trying to take their career to the next level. The information security field is in high demand, so the chances of either getting an entry level job, or an experienced position are very high. This site will lead you to the proper training that will make you a better information security professional. DoD IA Training Headquarters is here to decipher all of the information that’s freely available and give it to you, our readers in an organized way that’s easy to understand. We review training books, classes, and more to give you the “yellow brick road” to being successful in the DoD Information Assurance field. There are plenty of training sources, but we want you to have the best. Looking For Your Yearly DoD IA Training? 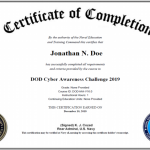 Looking for your DoD Cyber Awareness Training? Don’t get kicked off the network, and go to the link here. Ensure that you are using Internet Explorer to perform your DoD CyberAwareness Challenge. There are three versions, be sure you are taking the correct one. Thanks to Indeed Jobs, we have a live feed of DoD Information Assurance Jobs here on the site. Feel free to browse the listings. If you are a recruiter and would like to post a job, please contact us! If you have any questions or concerns, contact us using the form on the Contact page.